California Supported Living Network - What a Remarkable Guy! Michael Colls is a remarkable man. He has overcome many obstacles in his life. 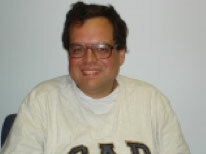 Michael has been receiving Supported Living Services through Jay Nolan Community Services since the year 2000. In 2006, the department received multiple special incident reports based on severe aggression from Michael towards community members and himself. To make matters worse, when Michael was diagnosed with diabetes, sleep apnea and high cholesterol, his circle of support felt they would have World War III on their hands (in terms of supporting him with these critical needs)! While his support members were trying their best to give him the tools he needed, there were many meetings set with Regional Center to discuss just how everyone was going to deliver the much-needed supports and, of course, everyone had their own suggestions. After four months of trying to encourage Michael, he began to show his support circle that if there were going to be any changes made, they would be on his own terms. Faced with his own mortality, Michael stared death in the face and decided to simply cut out regular soda and creamers to begin with, and ended up losing his first twenty pounds. Today, Michael has lost a total of sixty-seven pounds and is no longer plagued by Sleep Apnea. He is also off of his cholesterol medication and is managing his diabetes quite successfully—on his own! Recently he became interested in learning how to cook and prepare healthy meals. Did I mention that Michael is also currently a student at Glendal City College where he attends piano class. Oh...and he understands five languages and is fluent in two of them! What a transformation. Other areas of Michael’s life that have been positively effected by his new healthy lifestyle can be seen in his demeanor. In the past, Michael was very self-focused. Today, Michael looks to his support circle to assist him in finding a birthday present for his roommate and has recently expressed that he would like to assist other circles who are struggling with health issues. Wow! Michael is a true testament how self-motivation can change one’s life in amazing ways. We are all very proud of you, Michael!